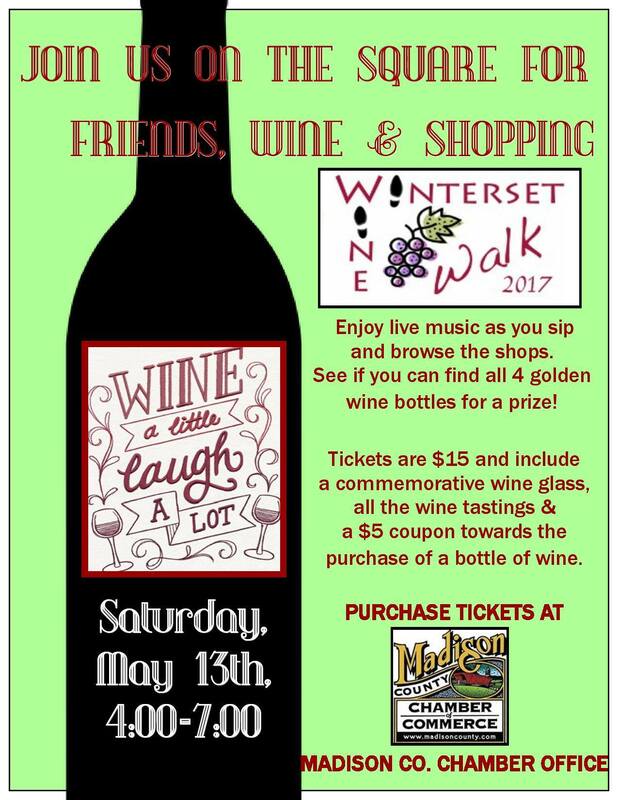 It’s not until NEXT weekend (May 13th), but it’s time to get serious about the Winterset Wine Walk now! Tickets are selling fast for this annual event that is conveniently timed the day before Mother’s Day, making it the perfect opportunity to treat your mom or join your friends for an evening of wine tasting, food sampling, and strolling around the lovely Winterset square. There are currently 25 businesses planning to participate in the wine walk, at 23 pouring stations at locations on and near the square. Wines will be from Covered Bridges Winery, Madison County Winery, and Two Saints Winery. On the north and west sides, simultaneous to the Wine Walk, the Central Iowa Auto Club will be hosting a Car Show & Shine from 4:00 to 7:00. There will be strolling entertainment on two corners, and the Madison County Cattlemen’s Club will be grilling burgers on the south side. I can smell it now! 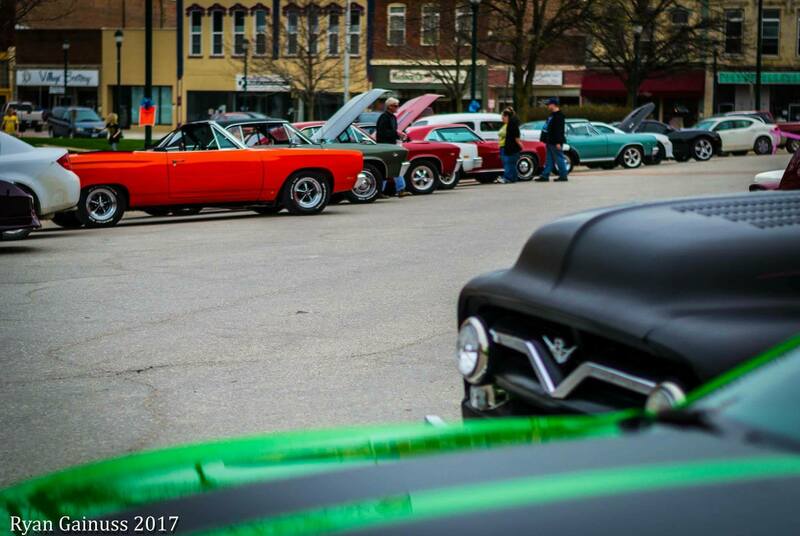 Beautiful photo of the April car show taken by Ryan Gainuss and posted to Central Iowa Auto Club on Facebook. As usual, participants will start at the Madison County Chamber office to pick up their commemorative wine glasses and wristbands before heading out to sample. Each registered participant will also receive a $5.00 coupon toward the purchase of their favorite bottle of wine from the evening. As a new twist this year, those who find and take photos of four golden wine bottles hidden in various businesses around the square will be eligible for a prize when they return to the Chamber office. The Winterset Wine Walk is hosted by the Madison County Chamber of Commerce. Tickets can be purchased in their office at 73 Jefferson, or online here. It’s been my pleasure to help with coordinating this event, and I hope to see you there! 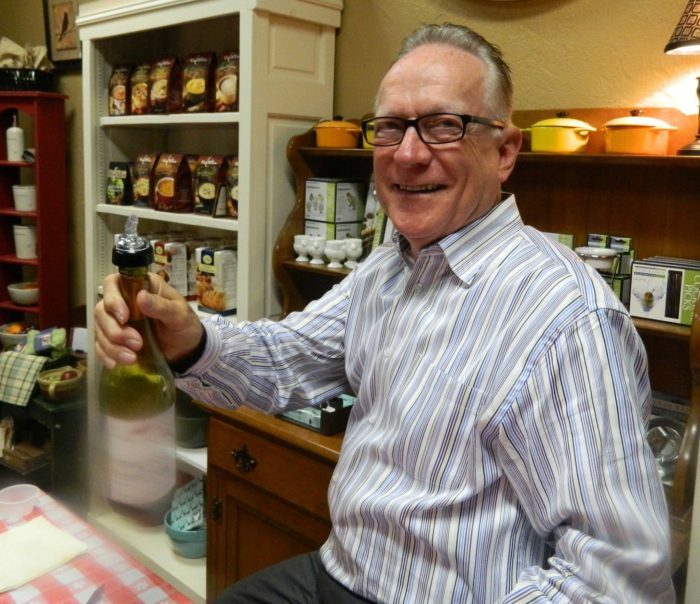 Bill Moody of Pine Creek Ltd. enjoyed pouring wine samples for visitors at last year’s Wine Walk and looks forward to another great event on May 13th. This Saturday, May 6th from 4:00 to 6:00 at the Winterset Library, Jennifer O’Neal of PepperHarrow Farm will be sharing information about farming, flower-arranging, floral design, and more. It is free and open to the public. 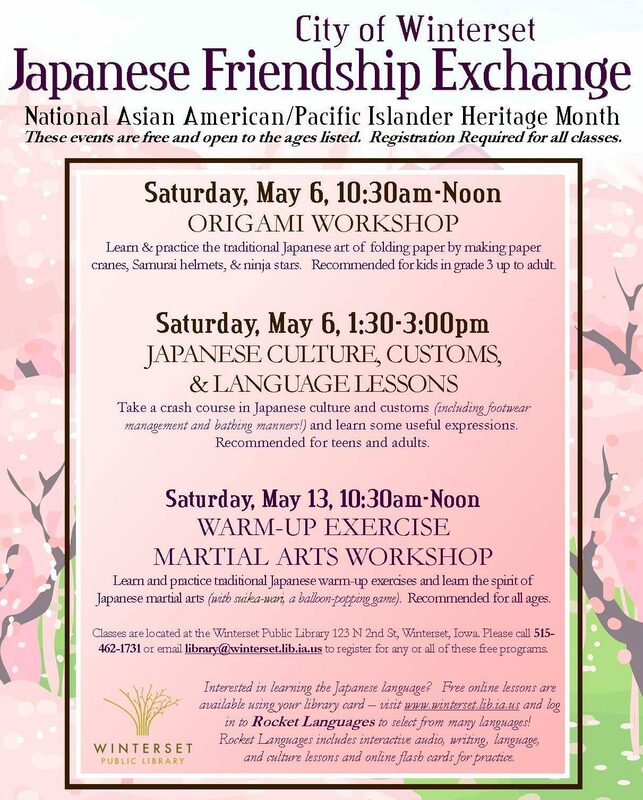 Also this Saturday, the City of Winterset’s Japanese Friendship Exchange is recognizing National Asian American/Pacific Islander Heritage Month by kicking off a series of workshops this weekend and next at the Winterset Library. These events are also free and open to the ages listed below for each, but registration is required. Call 462-1731 or email library@winterset.lib.ia.us to get signed up. 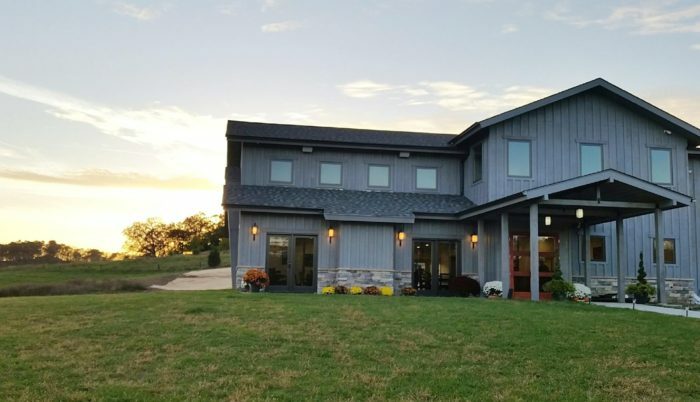 On Saturday evening, Covered Bridges Winery will host live music by The Miscellaneous from 7:00 to 10:00 pm, with barbecue by Rodell’s available from 6:30 to 8:30. $5.00 cover at the door. The Miscellaneous includes local musicians Leo Hensley and Andy Baumert blending classic rock, blues and pop standards with acoustic and bass. 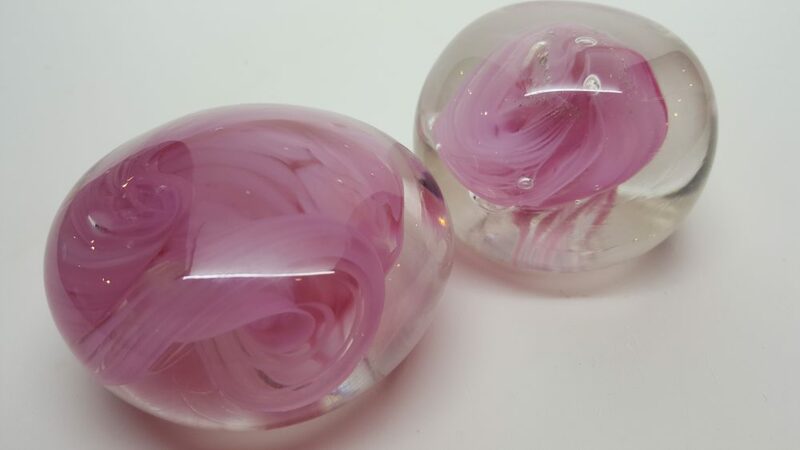 On Sunday, May 7th, Robin Paul is leading a Glass Rose Paperweight class from 10:00 to 2:00 pm at Madhaus Gallery. Participants can sign up for a 20 minute session between those hours, and Robin will show you how to create a beautiful work of art out of molten glass. Age 16+. No experience required; beginners welcome. Space is limited. Finished pieces will be ready for pickuup on Tuesday May 9, from 10:00 am to 4:00 pm, or by appointment. To sign up, call Robin at 515.707.4309 or e-mail glassideas@mchsi.com. World War I in Madison County will be the featured topic on Sunday, May 7 at 1:00 pm at the Historical Museum, just before the annual meeting of the Madison County Historical Society. “Madison County in World War I” by historian Darrek Orwig is free and open to the public. Nearly a century ago, soldiers from Madison County participated in World War I. The Iowa National Guard company based out of Winterset, Company A of the 168th Infantry, would be one of the first American units to arrive in France as part of the famous 42nd “Rainbow” Division. Learn about their experiences through artifacts, eye-witness accounts, historic images, artwork, and period motion picture footage. 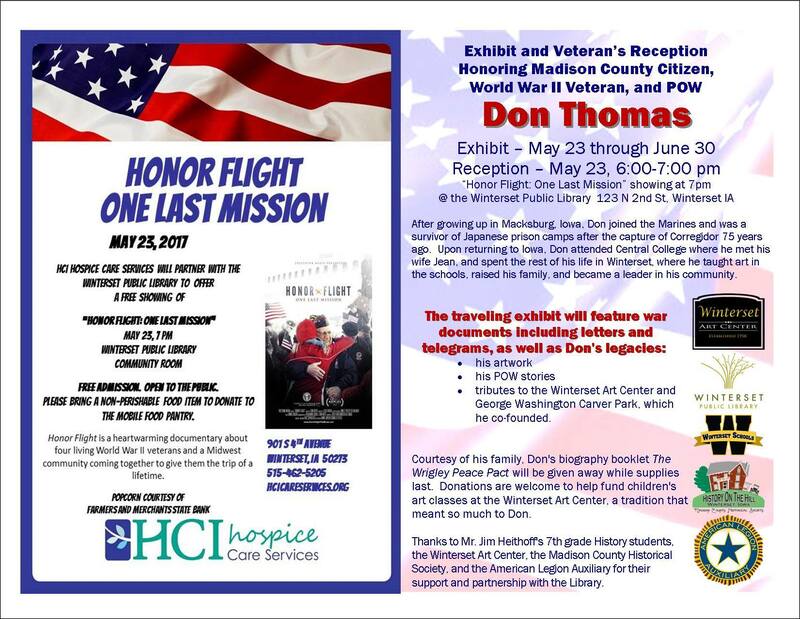 Doors will open at 12:30 pm so that the military exhibits throughout the museum will be available for viewing. Speaker Darrek Orwig holds a history degree from Iowa State University and a Master of Arts in historic preservation from the Savannah College of Art and Design. A portion of his research for this book was done in the Madison County Historical Museum. 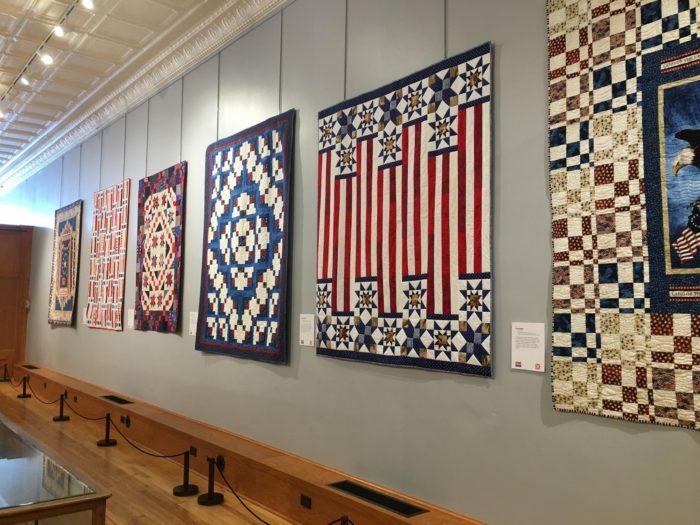 The Quilts of Valor Exhibit is now open at the Iowa Quilt Museum. Over 50 quilts were entered and 27 were selected to be in display in this patriotic exhibit. On July 9th, the quilts will be awarded to veterans in keeping with the foundation’s mission to cover service members and veterans touched by war with comforting and healing Quilts of Valor. The Iowa Quilt Museum is open Tuesday through Saturday from 10:00 to 4:00, and Sunday from Noon to 4:00. Stop by and see the new Quilts of Valor exhibit! 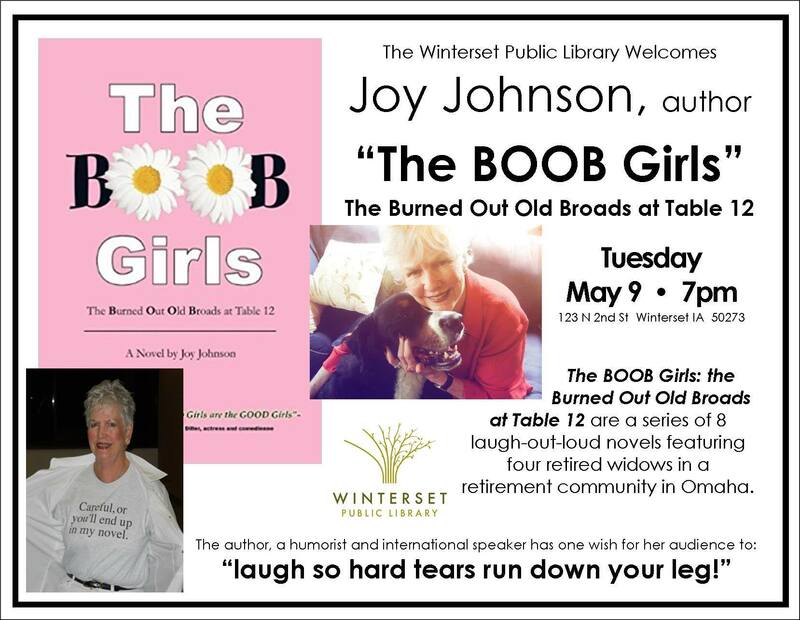 The Winterset Public Library welcomes visiting author Joy Johnson on Tuesday, May 9th at 7:00 pm. 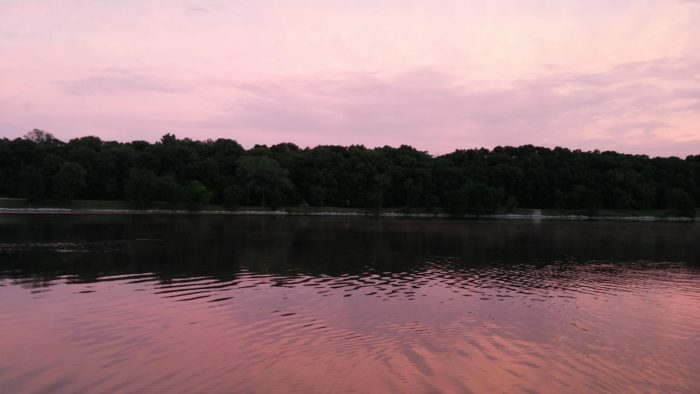 The Madison County River Alliance is hosting the first Full Moon Float of the season on May 10th at Badger Creek Lake. It is co-hosted by the Badger Creek Lake Watershed Project, and will begin with an informational session on the history of Badger Creek Watershed, the current watershed project, and a tour of conservation practices being implemented to improve water quality in the lake. The program starts at 6:00 pm. Participants are asked to meet at the lower (south) shelter pad on the east side of the lake for the watershed program. They will carpool to sites on the conservation tour, but will also be doing some walking, so appropriate footwear is encouraged. The Madison County River Alliance has a limited number of canoes that may be available for use during the float. If you would like to reserve a canoe in advance, contact the Madison County Conservation Board. Those staying for the campfire are encouraged to bring lawn chairs and beverages. Badger Creek State Recreation Area is located at 120th Lane, Van Meter. Enter 120th Lane from Badger Creek Rd. (south of 105th St. / north of 120th St.) If you have questions, call 515-462-3536 or e-mail naturalist@madisoncountyparks.org. 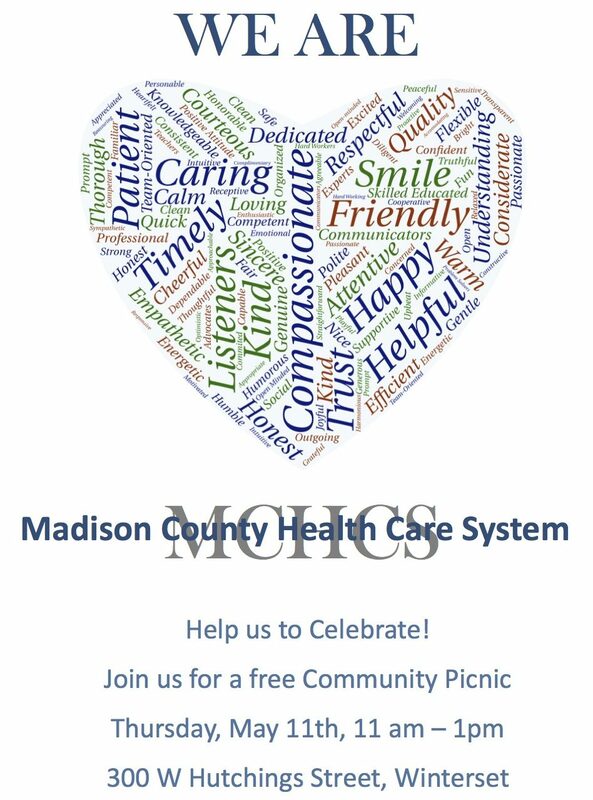 In recognition of National Hospital Week, May 7-13, the Madison County Hospital is hosting a free community picnic on Thursday, May 11 from 11:00 to 1:00 pm at 300 W. Hutchings Street. Tours of the facility will be available for those who are interested. 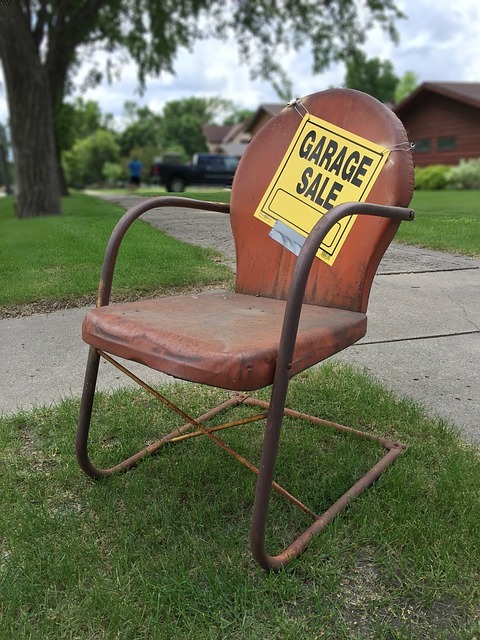 On May 13th, prior to the Wine Walk and Car Show festivities that start at 4:00 pm, Winterset will be busy with its annual City-wide Garage Sale. Garage sale ads are due to the Shopper on May 5th at 5:00 pm. If years past are any indication, Friday night and Saturday morning will be very busy with sales all over town. See next week’s Shopper for full details. Winterset’s City-wide Garage Sale is set for May 13th. Also on May 13th, The Winterset Cidery will open for the season with an event featuring Zachary Freedom from 6:00 to 9:00 pm. Registration for the John Wayne 5K Run/Walk continues, with the event taking place on Saturday, May 27th at 9:00 am. As part of the John Wayne Birthday Celebration festivities, it will begin and end on the corner of the John Wayne Museum. Register online here, or click to download a race brochure/paper registration form. This event his hosted by the Winterset Rotary Club and benefits C.R.I.S.P., the Rotary Scholarship Fund, and Winterset Skate Park. 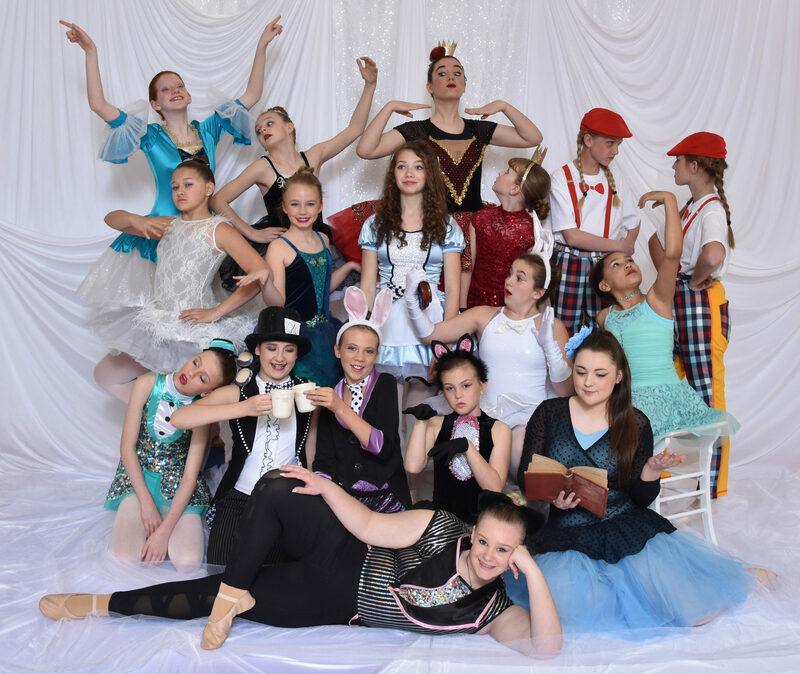 The annual recital for students of Winterset Ballet & Dance will be held Friday, June 9th at 6:00 pm and Saturday, June 10th at 3:00 pm in the WHS Auditorium. They will be performing Alice in Wonderland for the ballet, and the theme for the jazz, hip-hop and modern part of the recital is Moms, because all the moms are dancing in each of these dances! For the first time, tickets will be available for purchase online in advance here, starting Monday, May 8th. This means reserved seating! Tickets are just $5.00, and will also be available at the door. 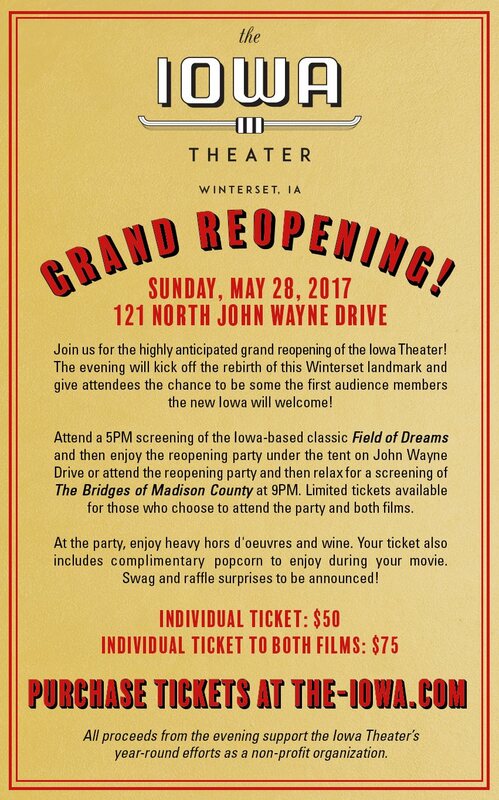 Here’s an update on the renovation of The Iowa, hurtling fast toward its Grand Re-opening date of May 28 (with pre-opening movie events on May 26 and 27, during the John Wayne Birthday Celebration weekend). Yesterday, Rebecca and Marianne Fons re-calculated the current total raised through creative fundraising efforts in the last few months, including seat sponsorships, one-time donations and pledges, etc. The new total, which does not yet include “round ups” from Fareway and Hy-Vee, stands at $142,016. The number of individuals/businesses that have donated is 232, making the average donation $612. Once the “round up” funds are in hand, as well as another $4,000 they’re aware of coming soon, they’ll soon be at $200,000 — the halfway point of their ambitious restoration project and labor of love. The goal to finish paying the costs of renovation and digital outfitting is $400,000. Next weekend, you’ll have an opportunity to show your support for The Iowa and add to their progress by stopping by the ticket lobby during the Wine Walk. Tickets to the May 28th Grand Re-opening have only been sold online up to this point, but they’ll be selling tickets in person during the Wine Walk (in addition to, of course, sampling wine!). I know they’d love to see you there.